Potstickers and noodles mean only one thing, North Park. The heart of the Pacific Northwest, Seattle is a city of contrasts, celebrating a rich history and heritage yet progressive and always on the cutting edge. And it's easy to sat wide awake and sleepless...in Seattle. A half empty jar of Mountain Maid Strawberry Jam, a few slices of Jipan bread, and a lot of butter...perfect. Made by the nuns of Good Shepherd in Baguio, it's a definite must-buy when you visit the summer capital. With real chunks of strawberry, it's a great example of a local success story, earning the good nuns some fame, and giving back to the community. Almost two years after this trip, I still can't help but feel awed by the power and beauty of Mount St. Helens. Getting the 4x4 rental stuck in the deep snow and being helped by some locals, and body flopping on the snow while no one was lookng...awesome. An old restaurant gets a new name, but the links with its past remains with the same cuisine and flavors known for generations. Panciteria de San Jacinto, now Comida China de Manila, continues to serve old Chinatown style favorites (see the Dude's previous post on Panciteria de San Jacinto at http://dude4food.blogspot.com/2011/10/going-chinese-in-hundred-year-old.html). Fried Prawns with Alexander Sauce, sweet and tangy, with a little heat. Fancy name, but the flavors are familiar. Driving eastbound on I-84, it's roughly a half hour drive from Portland. It's an easy and comfortable drive, just set your GPS and you're on your way/ Said to be one of the highest falls in the US, Multnomah Falls consists of two spectacular drops, combining for a total height of more than 600 feet. Jipan Japanese Bakery's Loaf Bread, not just any bread. Rich, soft and creamy, the secret is real butter. An unexpected detour from the road trip to Portland two years ago...and a historic covered bridge...awesome. Driving along I-5, I decided to go for coffee at a gas station. And I'm glad I did. Turning left at Sunny Valley Exit, I spotted the bridge. Built in 1920, the classic wooden covered bridge just brings back an old movie feel. A break in the weather allowed a little more sunlight to reveal the classic lines of the bridge. Perfect. The Dude's in the mood for a steak, not the usual steak, but something different. And one place comes to mind: L'Entrecote, with its special "secret herb butter sauce" that is unique to this place. Great steak, great sauce, great fries. Just perfect. Go for the L'Entrecote Set Menu (P 980+) which includes US Certified Angus Steak, fresh fries and the House Salad. Now you can have traditional French Bistro style steak frite with a rich butter sauce without flying to Paris. I had to find a lighthouse. After a long drive to Tillamook from a road trip two years ago, and an unforgettable Mudslide double scoop at the Tillamook Cheese Factory, I quickly asked directions for the nearest lighthouse, and controlling my urge for another double scoop. Light was fading fast, and finally I found it...the Cape Meares Lighthouse. Awesome way to cap an awesome road trip. Construction began in 1590 by the Spaniards, making Manila the capital of their new colony. 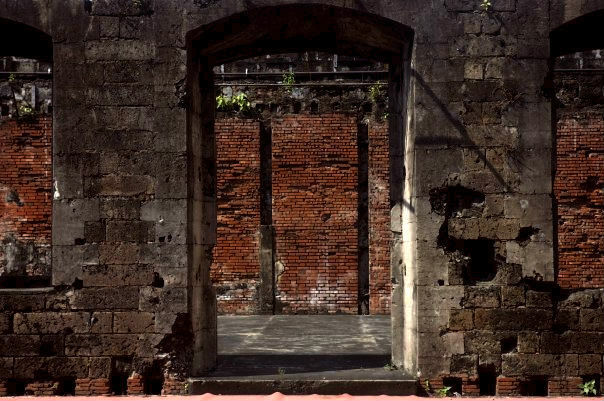 The protected walled city formed a defensive ring from pirates and foreign invaders, and was often referred to as Intramuros, or "within the walls". Situated beside the Pasig River, Fort Santiago served as the main fort during the spice trades and the Manila-Acapulco Galleon Trade. Had a major burger craving, a real serious one. When the usual double patty just won't cut it, you go for the Bully Boy Burger at Army Navy. Cool interior wall graphics with schematics of the the military Quonset Hut. The military theme is carried over in the bare "barracks" inspired look down to the tin plates for the burgers. Very cool.